Valentine's Day is special. It's the one day of the year where everyone is thinking about love and romance. 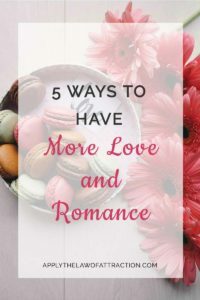 If you want to add even more love and romance into this special day, the action-filled tips below will help get you started. It's all about what you want and making it happen. Want breakfast in bed on Valentine's Day? Tip 1. Speak up! If you're in a relationship, it's okay to tell your partner, romantic other-self, or soul mate that you want breakfast in bed. It doesn't matter how the breakfast gets to your bed. Maybe you'll need to help scramble eggs, butter toast, grind coffee and place everything on a tray, but take that try back to bed! Crawl back into bed and share toast crumbs across the sheets. The all important thing is to ask for what you want. The Universe will hear you and help out. Want a special dinner at a special restaurant? Tip 2. Make the reservation! It doesn't really matter who has the idea for eating out somewhere or making the all important reservation. What matters is that someone took action and made it happen. You're favorite restaurant booked up? Call another. This might just be the time to find an even better place. The most important part is listening to the scratch-scratch-scratch of heavy cutlery on pearly white plates while glowing with love and making that phone call. Want to get away on a romance-filled trip? Tip 3. Plan it! Talk to a travel agent. Get brochures. Plan when to go. Book flights or put gas in the car. If it's a surprise, pack a special bag for your loved one with something romantic that they've always wanted but never dreamed of buying. If you're not into travel, then go on a safari in your living room. Pile blankets on the floor. Drape sheets over chairs. Turn off lights. Read to each other by flash light. Want to have more conversation? Tip 4. Unplug! Turn off, shut down, unplug all TVs, laptops, iPads, phones and any other electronic gadget that consumes your life. Distractions stop speech. Ever ask someone to talk on the phone while turning their car around? It's not pretty. If the TV is on, you and your soul mate are watching it and not each other. If email is flying at you, it will be opened because we are programmed to not ignore it. Give your mind a break. Give your loved one your full attention. Amazing things may happen. And, while you're at it, turn off the Wi-Fi. Your brain will thank you. Want to have more love and more love and more love? Tip 5. Make every day Valentine's Day! Ask for everyday to be special. Ask the Universe for good things to be in your life, for romance and love, for time to share life with your special partner. Make an effort to do some kind thing for your soul mate every day. Be the first one up to make the coffee. Tell them they look nice. Leave a funny note on their pillow. Ask for the same special things to come to you.